The Sol Africa program in Brazil will consider sending more teachers to Africa to help pastors at United Methodist missions in Portuguese-speaking Africa. Graphic illustration from the Greater Board of Higher Education and Ministry. SAO PAULO, Brazil -- Since 2008, 23 pastors and teachers from Mozambique and Angola have studied at Methodist University in São Paulo and returned home to train other pastors in their annual conferences. The university's Sol Africa program also brings lecturers from the university in Brazil to hold classes in Africa that can reach even more Portuguese-speaking Africans. Quelende said there are some who think sending Brazilians to Africa reaches more pastors, and that will be discussed at the meeting. “Some of the lecturers from Brazil who went to Africa taught 20 to 25 pastors in each class they offered.” He said that meant more than 100 pastors were trained in each of four annual conferences in Mozambique and Angola. Overall, feedback about the program has been positive. Participants and annual conference leaders believe the studies have helped pastors to have a broader understanding of The United Methodist Church. Among those with local ties attending the program was Rogerio Bartolomeu, professor at the School of Theology in Quéssua, East Angola, where the Florida Conference has had a partnership for the past decade. He attended last fall. 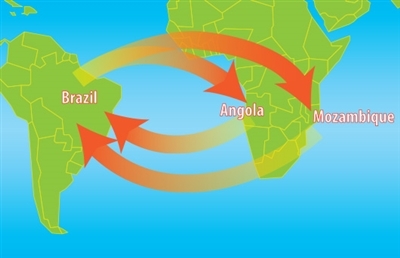 Angola is one of several countries in Africa where Portuguese is spoken. The pastors who travel to São Paulo spend three months studying at Methodist University. The sixth group returned recently, Quelende said. While at the university, pastors undergo intensive training studying homiletics, Christian education, pastoral care and counseling and more. At the end of three months, each receives a collection of books about the subjects they studied. Rev. Almeida Lemba, director of the program in Angola, said 10 pastors from the Western Angola Conference have been trained in research and teaching of subjects such as Bible study, evangelism, Wesleyan theology and more. “Back home the pastors who studied in Brazil have been very helpful to pastoral work in the conference. They teach some subjects in our course of study, and during a theological refreshment week, the conference holds each year for all pastors, they teach all of the subjects they have studied,” Lemba said. He added that one of the major benefits for the Western Angola Conference has been the diversity of theological literature in Portuguese and the translations that were done expressly for the Sol Africa program. Rev. Olga Ranchaze, director of the program in Mozambique, said all of the pastors who have traveled to Brazil have learned a great deal and that the only complaint she has heard is that three months is a long time. “We as a conference would also appreciate it if this program would continue sending Brazilian lecturers to Mozambique and Angola,” she said. That would allow a larger number of pastors to participate in the program by attending lectures. * Brown is associate editor and writer, Office of Interpretation, General Board of Higher Education and Ministry. Susan Green, managing editor of Florida Conference Connection, contributed to this story.